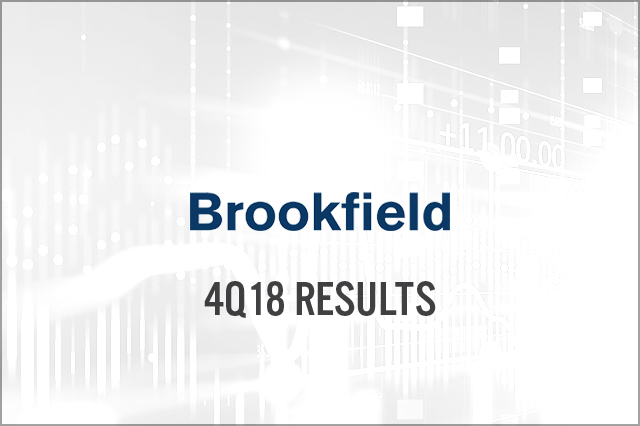 Brookfield reported 4Q18 FFOPS of $0.43, up 19.0% year over year and beating the $0.38 consensus estimate. Net income was $0.51 per unit, compared to $0.17 in the year-ago quarter. Core-office occupancy increased 60 basis points to 93.5%, and new leases signed featured 8% higher rents than expiring leases. During the quarter, the company disposed of four limited partnership (LP) investments, sold five core assets, made six new LP investments and separately launched a bid to repurchase up to $500 million of BPY units and Class A shares.